The latest figures for the global asbestos trade released by the United States Geological Survey (USGS) (see provisional USGS Asbestos Data 2013) have been available for some time.1 However, interpreting them has been rendered more difficult than usual by a change in allocation to the USGS regional categories; whereas Russia and the former Soviet republics Kazakhstan, Kyrgyzstan, Tajikistan, Turkmenistan, and Uzbekistan had formerly been classified as European states (to facilitate comparison with Soviet era data), in the 2013 data the USGS transferred them to its Asia and Middle East regional category. This makes direct comparison with earlier regional data we have charted unhelpful. In future regional comparisons (as in Chart 3 shown later in this article) we will group the above former Soviet states with the rest of Asia but continue to consider Russia as European, though in truth it should be in a category of its own; one that might also include non-EU former soviet bloc states such as Belarus, Ukraine and Azerbaijan. 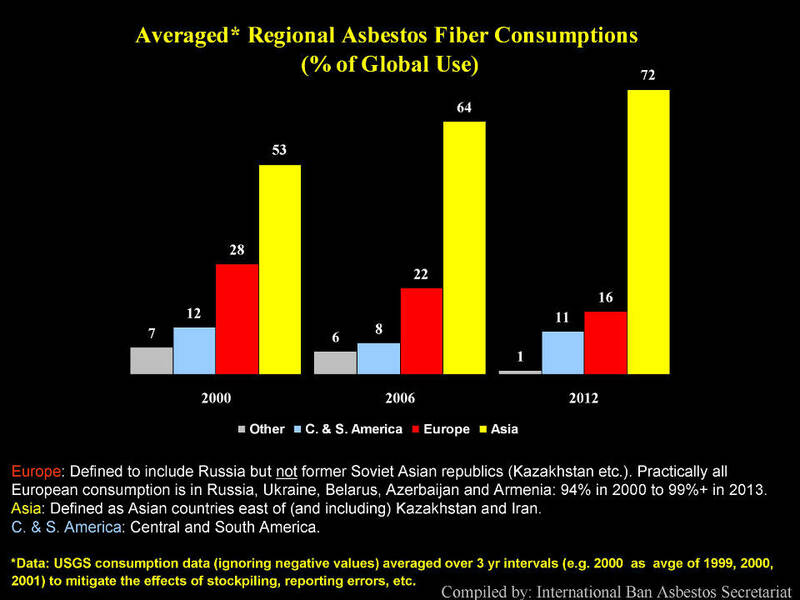 The latter states together with Russia account for over 99% of European asbestos consumption. In 2013 global asbestos production was 2,019,000 tonnes, roughly equivalent to outputs in 2011 and 2012 which were 2,035,000 and 1,988,000 tonnes, respectively (see provisional releases of USGS data 2011 and USGS data 2012). 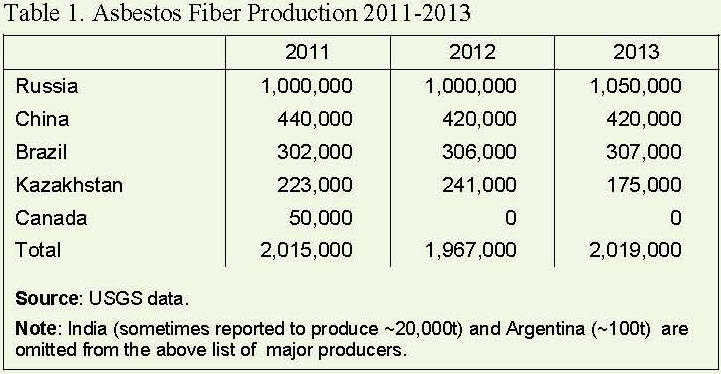 The major producing countries retained their relative market share with Russia remaining the biggest supplier of raw asbestos fiber (Table 1). Results from table 3 together with additional average values calculated for 2002, 2004, and 2008 are charted below. For the heaviest users (Chart 1) there seems little to celebrate. 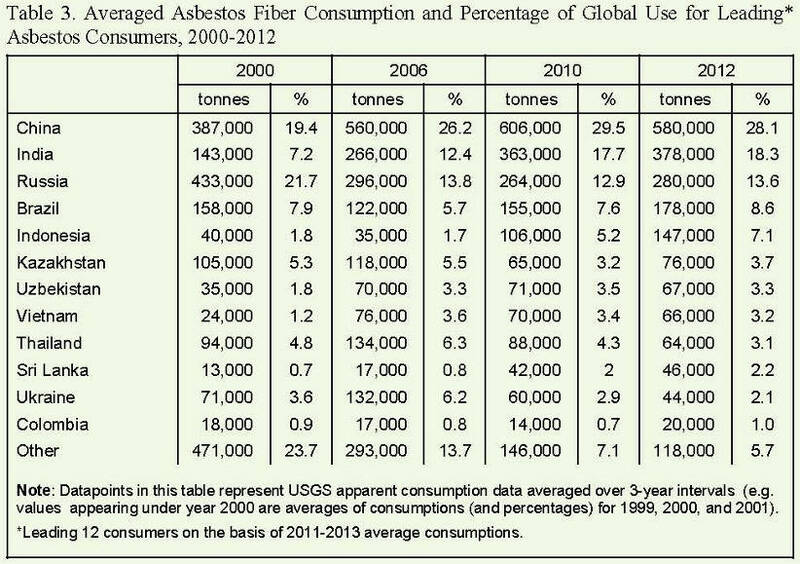 A marked falling off of use in Russia may be significant; but as Russia produces half the worlds asbestos fiber (see Table 3) its difficult to distinguish between genuine reduction of asbestos consumption and prolonged growth in unused asbestos stocks. 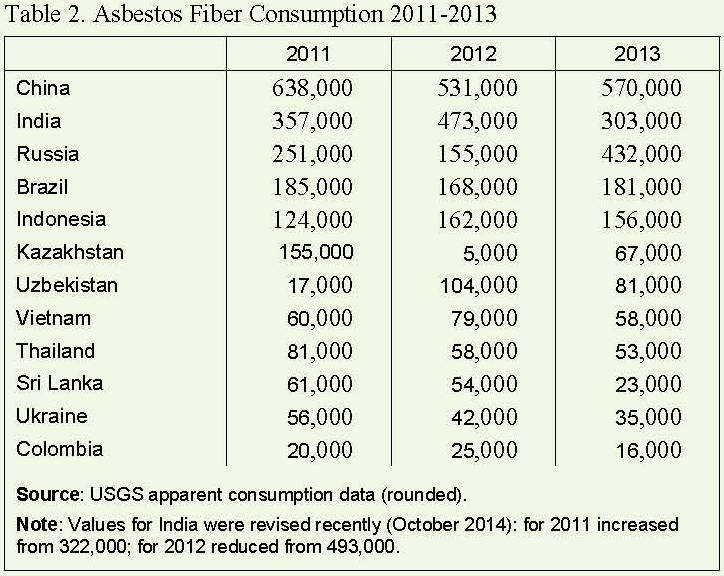 The rapid growth in asbestos consumption shown by India and China between 2000 and 2008 seems to have eased  in Chinas case even fallen back by ~7% from its peak in 2008. However, reductions in economic activity may explain these observations. 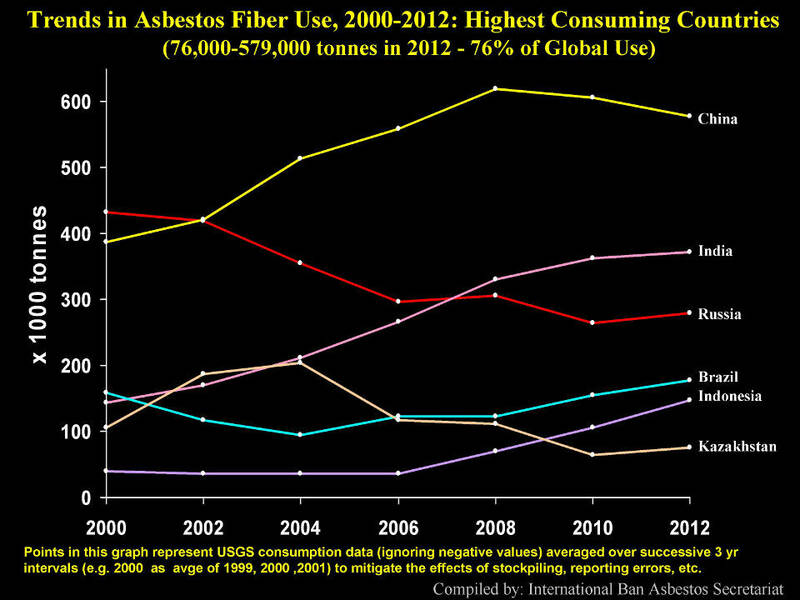 The increase in asbestos consumption in Indonesia, which started around 2006, continues unabated. In Chart 2 there are more promising signs. 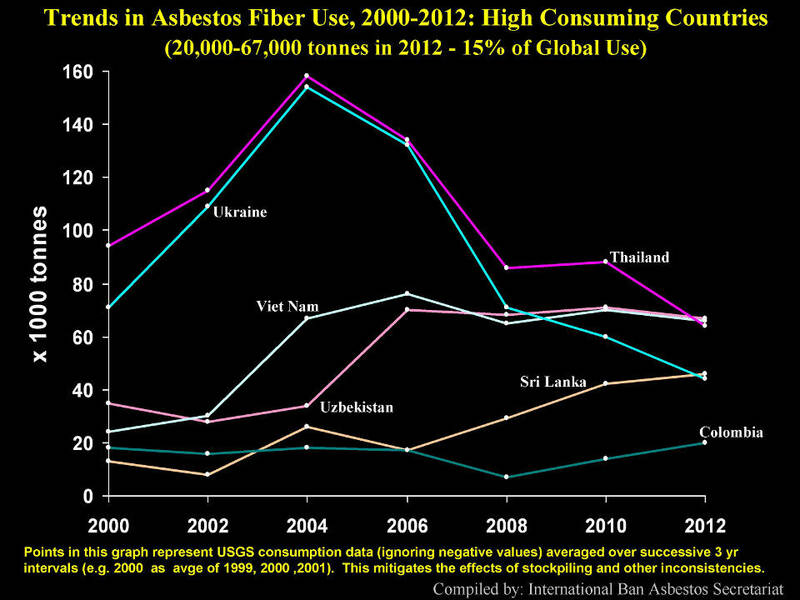 Asbestos consumptions in both Ukraine and Thailand are falling rapidly, after rising rapidly between 2000 and 2005. Annual consumptions for both countries are now (2011-13) running at more than 30% below what they were in 2000 and more than 60% less than the peak values reached in 2004-5. In the case of Thailand, there seemed a distinct change of policy direction following the Global Asbestos Congress held in Bangkok in 2006. In Vietnam, there appears to have been no growth in annual asbestos consumption for more than six years, but the country is still ranked 6th globally in terms of asbestos use with current consumption running at 65-70,000 tonnes per year. Over recent years, Asian asbestos markets have absorbed the majority of asbestos used worldwide. In 2011-2013 the proportion of global asbestos consumption for this region reached 72%; even more remarkably, around 90% of all exported asbestos ended up in Asia, with another ~9% being imported by just five countries: Ukraine, Belarus, Mexico, Cuba and Colombia. As discussed above, with the exception of the continued rapid increase of asbestos use in Indonesia, there are encouraging signs of a cooling of demand, particularly if the 2013 results are looked at in isolation. However, there is no room for complacency: asbestos production has remained high and increased consumption has been observed in some Asian countries where asbestos use has reportedly been low in the past  Bangladesh, Turkmenistan, and Pakistan. Politically, however, there are indications that countries are turning away from asbestos and the number of nations consuming more than 500 tonnes/year in 2013 was down to 33 (from 37 in 2012). Although marketing by asbestos stakeholders has, for the time being, maintained the status quo, support is growing for the ban asbestos campaign with discussions now taking place at the highest levels of government and the judiciary in Brazil, Thailand, Vietnam and the Philippines; increasing public awareness of the asbestos hazard and the use of social media platforms are progressing calls by civil society for universal action to outlaw asbestos use. The struggle continues! 1 The USGS statistics are calculated using trade data collected by the United Nations Commodity Trade Statistics Database. The UN data are based on information received from national governments. Data quoted for years after 2003 are likely to be taken from provisional USGS worksheets; these are released about six months after the end of the years to which they apply.